On Tuesday, August 12, C.L.A.W. took over the back lot of the Blue Moon Diner to raise money for Food Not Bombs, and once again, an outrageously good time was had by all. 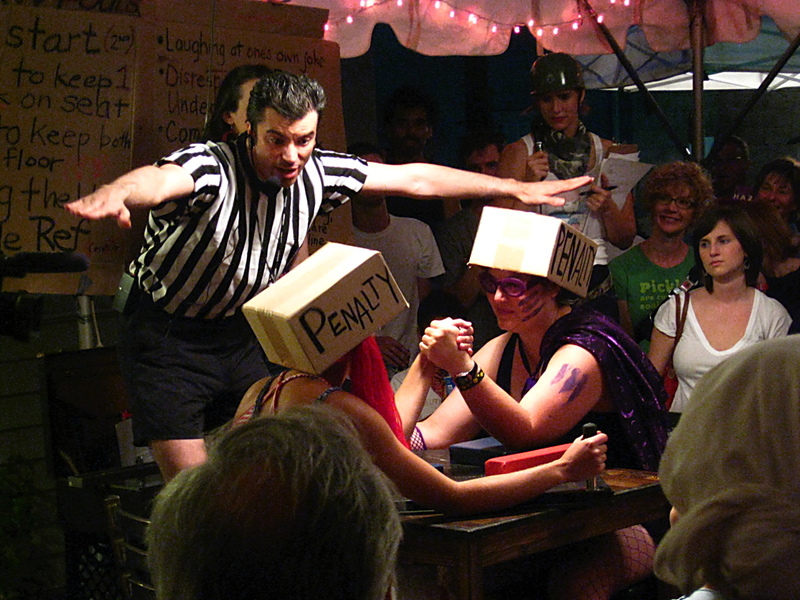 Charlottesville Lady Arm Wrestlers is the brainchild of Jennifer Tidwell – a.k.a. MC Rosie the Wrist Twister – and for this warped stroke of genius she deserves major accolades. Charlottesville has seen its share of groovy alternative scenes, but C.L.A.W. is, by far, the most entertaining. Not to mention lucrative. And for charity! C.L.A.W. is everything pro wrestling wishes it was. 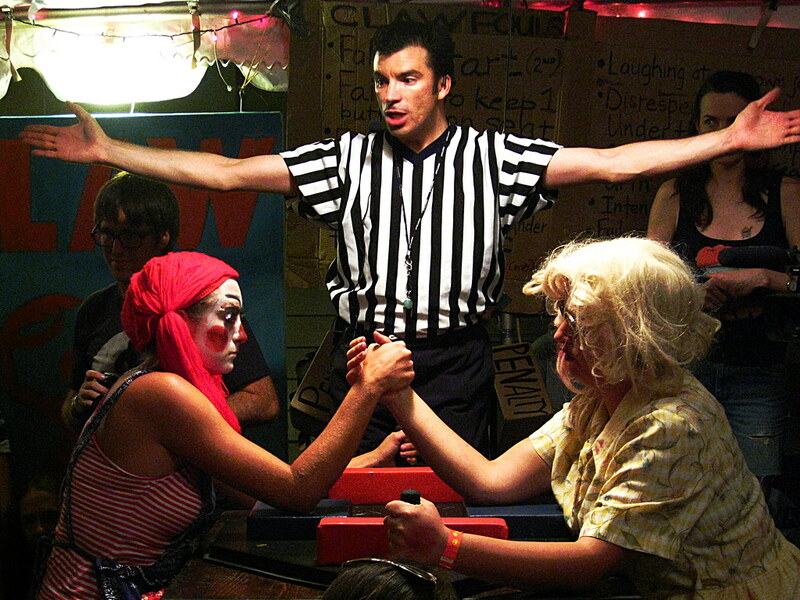 Pure cotton candy diversion featuring epic ridiculous characters battling it out on a table littered with payola. Here’s the skinny: Admission is free. (But show up on time – they have a limit on entrants, and it fills up fast.) The dollars come in through the purchase of $1 CLAWBUCKS which are then used to back a wrestler, bribe a ref, bribe the judges, bribe the band. Whatever. Bribe somebody already. 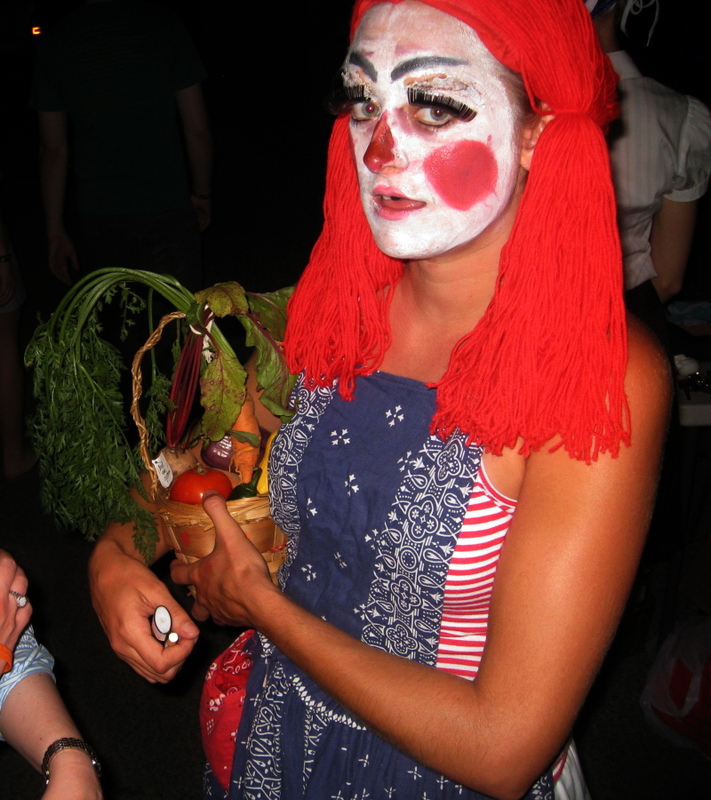 Eight wrestlers boil down elimination-style to one victor, in this case, Tragedy Ann, who recieved her first title and trophy – a small basket of vegetables – with relish. The losers seem chipper, too. I’m pretty sure it’s fixed, anyway. More pics can be found over at my flickr photostream. I also recommend Billy Hunt’s excellent photos. This entry was posted on August 15, 2008 at 3:25 pm and is filed under cripsyduck with tags Blue Moon Diner, C.L.A.W., Charlottesville Lady Arm Wrestlers, Jim Waive, Straight Punch to the Crotch. You can follow any responses to this entry through the RSS 2.0 feed. You can leave a response, or trackback from your own site.